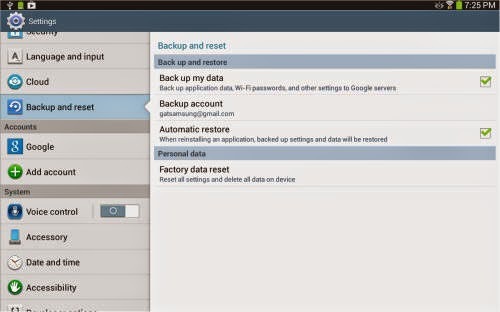 Doing a factory data reset will clear the device's memory and restore its original factory default settings. A reset has been known to resolve several issues on various Samsung smartphones and tablets. Nevertheless, performing a factory reset will likewise erase all personal data stored by the user on the device. This is because Factory Data Reset is a tool for removing every imported file, or any other applications added to or installed on the device. Hint: A back-up on your contact and email information will automatically be generated via Gmail server after performing a factory data reset. Hence, by the time you log in using your username and a password, the information will be retained. Step 1. Tap the Home Key. Step 2. Tap the Apps button to continue. Step 4. Tap Back Up and Reset. Wait until the reset is complete and you then should have your Galaxy Tab 3 back to the original factory default settings.